You always carry floss in your purse and look at people's teeth when you meet them. Your back is killing you right now! The smell of Listerine turn you on. You get excited when calculus goes flying!!! you know that calculus isn't math! You smell perio while in a group of people and desperately look (sniff) around until you figure out who it is. you laugh at the Braun Oral B commercials claiming to be dentist #1 recommended toothbrush. Ummmm.........who's with me on the Phillips Sonicare??? When you can't help but go down the dental isle just to look. You know what " PITA" stands for. you can't find a job! Just further evidence that you can't stare at teeth all day without becoming a little bit quirky. Read all the clever responses here. We all know and love hip-hop star MC Mong, right? Ok, for those of us who live outside of Korea, he's like their Justin Timberlake - known for his comic disposition and upbeat songs. MC Mong's real name is Shin Dong-hyun, which begs the question, with a name like Dong-hyun, why would you even need to come up with a stage name? Anyhoo, the reason he showed up on my radar is that he got himself into a little trouble. He recently had three healthy teeth extracted in order to physically disqualify himself from Korea's mandatory two-year military requirement that all able-bodied males must fulfill. The news stories (AP and Korea Times) don't specifically mention a dentist being involved, but both use terminology along the lines of "had healthy teeth extracted" rather than "pulled his own teeth". I don't have enough information to form a strong opinion regarding the dentist, but at the very least this brings up some serious ethical questions regarding non-maleficence vs. patient autonomy. Ah, the beauty of twitter. Allowing our favorite stars and celebrities to share otherwise personal moments with the world. How else would you have ever seen photos of Cincinnati Bengal's wide receiver Chad Ochocinco posing with his wisdom teeth and exclaiming how awesome the sound was? How else would we have seen pictures of Demi Moore making fun of her toothless smile, and how else would we have realized how intelligent Lindsay Lohan was when she claimed to have post-extraction "phantom tooth pain"? Brilliant! On that note, the Dental Ninja has decided to stealthily venture into the world of twitter. Twitter will allow me to share more with less. You see, my busy schedule as a daytime dentist/nighttime ninja allows me to blog about one or two stories each week. Generally for each story I share, there are 4 or 5 items of interest that don't make the cut. Henceforth I shall tweet them to you. 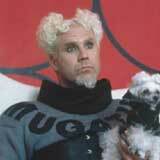 Maybe I didn't give the movie "Zoolander" enough credit. Rather than simply an entertaining comedy, stories like this one have helped me see it as more of an exposé of the weird world of fashion - a world I admittedly don't understand. Think about it - ask yourself which is more bizarre, Jacobim Mugatu (pictured above) launching the clothing line "Derelicte" inspired by the homeless vagrants of NYC, or David Delphin (pictured below) paying an orthodontist to intentionally separate his central incisors as a metaphor for the separation he was feeling after his father's death. This, to accompany the launch of his new clothing line "Diastema". I'm not joking. He named the clothing line diastema. Delphin is unfortunately inspiring others in the modeling world to follow suit. This has been covered by many media outlets this week, but the original story appeared here in the Wall Street Journal, with a nice sideshow of what gap-toothed models look like. Sidenote - at age 22 when I set my sights on a career in dentistry, I had an orthodontist close the gap in my front teeth. I had two reasons: 1) I realized that nobody would trust a dentist with crooked teeth and 2) fixing my smile could only improve my chances with the ladies. Maybe on some subconscious level I was doing this to symbolize the closeness I felt with my then (and now) living father. On second thought, I'll stick with the first two reasons. Unless you've been living under a rock for the past month, by now you've heard about the men trapped in a collapsed Chilean mine. (Pun intended). In case you haven't, let wikipedia catch you up on the story. The gist of it is that one month ago the roof collapsed, leaving 33 men stuck 700 meters below the surface. They have enough room and they seem to be pretty organized, having divided themselves into various groups in charge of care packages, security, and health. Experts are predicting the men will likely be stuck until sometime in December. After two weeks, contact was made via a small bore-hole and the men were able to communicate with the outside world and request supplies. The first necessities they asked for were oxygen tanks and toothbrushes! Hooray for healthy teeth! Unfortunately, with that many men stuck for that long, a couple of them have already developed toothaches. Yikes. According to the national emergency office, "...some of them have started to feel dental discomfort, on which the relevant treatment will be carried out." I would imagine one of the next care packages they get will include some pain killers, anesthetic, extraction instruments, and a few pages of detailed instruction on how to remove a tooth. I'd even throw in an Ipod with video clips demonstrating proper tooth removal! Either way, my heart sure goes out to these men and I hope and pray this story has a happy ending.